Green Humour: Shoulda been more specific, Cowboy! Shoulda been more specific, Cowboy! 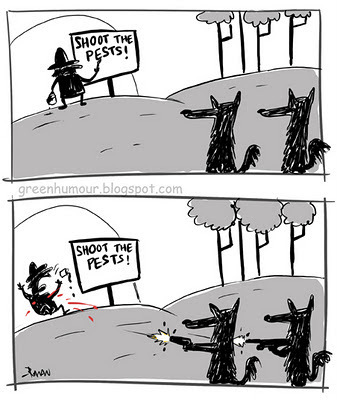 Wolves in the USA are still considered pests, and in some states, are permitted to be shot unchecked. Indiscriminate shooting of the Northern Rockies wolf following its removal from the endangered species' list is decimating the populations of this North-American sub-species.